The analysis and interpretation of linguistic structures in authentic, digitized historic sources and materials with the help of data visualization tools has the potential to raise learners’ critical cultural awareness of the target culture while at the same time raising and expanding their linguistic awareness. Byram’s Model for Intercultural Communicative Competence (1997) defined critical cultural awareness as “…an ability to evaluate critically and on the basis of explicit criteria perspectives, practices and products in one’s own and other cultures and countries” (p. 53) and posited that it enriches and facilitates the acquisition of a foreign language. This definition has also been incorporated into the ACTFL National Standards for Foreign Language Learning. Language serves as the prime vehicle to embed cultural perspectives in its structures and lexicon, describes and reports on the practices within culture(s), and contributes to the emergence of cultural products. Data visualization tools can aid FL learners -especially at the intermediate level -to untangle and decipher these complex, profound relationships between language and culture. By means of dual coding -verbal and non-verbal, learners process the abstract vocabulary and complex structures of authentic sources with a positive effect on comprehension, retention, and production. (Paivio, 2006, p. 181) Additionally, data visualization appeals to the multi-literacy competencies of digital natives since digital natives are “…operating at twitch speed (not conventional speed); employing random access (not step-by-step); parallel processing (not linear processing); graphics first (not text); play oriented (not work); connected (not stand alone).” (Pendergast, 2010, p. 3) Data visualization tools appeal to most if not all of these characteristics: they offer multiple entries to non-linear processing of texts, they produce images to supplement text comprehension and analysis, and they offer options for text manipulation that may appear rather playful on the surface but that can also be harnessed for critical engagement with course materials. Our project aims to raise learners’ awareness of the multi-faceted nature of language and culture as well as cultural meaning embedded in language. 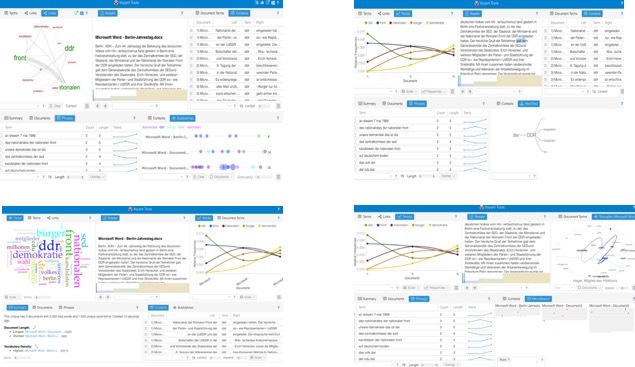 In our project, learners in an intermediate German course at a postsecondary institution will employ text analysis tools for critical observation and reflection of linguistic choices within the source materials. Learners will use text analysis tools to decode embedded cultural perspectives in the target language, assess their own assumptions, and ultimately also reach a better understanding of their own culture. Additionally, our learners will be contributing to the body of knowledge of German language, culture, and history. We hope to achieve this while simultaneously raising learners’ awareness of the possibilities that Digital Humanities offers and introducing them to some of the learning tools used in Digital Humanities research. We believe learners will thereby also learn a transferable skill. In this particular course, learners will engage with the history of the German Democratic Republic (GDR) through the novel Am kürzeren Ende der Sonnenallee. Our presentation focuses on personal and public accounts of key events during the period of 1945-1990 that are referenced in the novel. We are especially interested in the intersection of public and private spheres as conveyed through historic sources. Our work with the novel for this project will be the culmination of our co-authored textbook Bewegungen (in preparation for submission), which implements an innovative fourth semester bridge curriculum and aims at revealing multiple perspectives within culture embedded in language. Learners will examine digitized historic sources (digitized archives of newspapers, eye witness accounts, etc.) about significant events through both public and private accounts to complement the fictional account in the novel. This will provide learners with a multi-layered perspective: the sequence of events (reported facts) and the way the source/account frames and presents events linguistically, semantically, and visually and thereby frames meaning for the reader. Learners will be divided into two teams. One team will work with a selection of different public GDR accounts (e.g., newspapers, history textbooks, radio and TV reports etc.) of the events, while the other team will use a selection of private GDR accounts (eyewitnesses, photos, letters, etc.) of the events. Using data visualization tools such as Voyant. Learners will be able to compare the personal and public accounts in an exploratory qualitative data analysis and gain a better understanding of life in the GDR. This project promotes not only FL acquisition and critical cultural awareness but also develops valuable research skills. Data visualization compels learners to develop what Kramer coined the bridge between evidence and argument because they will have to make decisions on how to select, evaluate and present data (Kramer, 2012). Thus, learners will become active participants in creating meaning in L2: they will make choices (from a selection of accounts), explain their choices, analyze the language, acquire a new skill through the Digital Humanities tools etc., that is, language acquisition will happen dynamically instead of passively. Learners will also become aware of the limitations of their research tools and methods. However, teaching with Digital Humanities in an intermediate foreign language class also poses certain challenges. We anticipate that learners’ limitations within L2 and their unfamiliarity with Digital Humanities will be among the most challenging. We have three goals for the future of the project. First, in the near future, we hope to expand our project by having future classes/learners contribute to the project. Second, we hope to include non-textual accounts of historic events (e.g., photos, videos, artefacts) to develop models of how to analyze and interpret these digital sources. Third, we hope to be able to collaborate with other colleges/universities teaching the novel and have their learners contribute to our interactive and collaborative publishing platform (e.g., WordPress, Omeka, Scalar). Byram, M. (1997). Teaching and Assessing Intercultural Communicative Competence. Clevedon, United Kingdom: Multilingual Matters Ltd.
Paivio, A. (2006). Mind and Its Evolution: A Dual Coding Theoretical Interpretation. Mahwah, NJ: Lawrence Erlbaum Associates, Inc.
Pendergast, D. (March, 2010). Connecting with Millennials: Using Tag Clouds to Build a Folksonomy from Key Home Economics Documents. Family and Consumer Sciences Research Journal. 38 (3), 289-302.